Angelina Jolie is all set to join the Marvel Avengers! Until now, Thor, Vision, Scarlett Witch, and Captain Marvel were the only ones who were almost or equals of the god level being in the Avengers franchise. But once Phase 3 has ended with Endgame; the Avengers HQ might see a handful number of heroes possessing the power of cosmic level. And filling in any of those slots may be one of the leading ladies of Hollywood. Apparently, various sources are reporting that an Academy honoree, Angelina Jolie is currently under the talks with Marvel Studios to have a major role in the upcoming MCU movie, Eternals. Variety reports that the film will be directed by a Chinese filmmaker, Chloe Zhao. Angelina Jolie is set to star in Marvel's The Eternals. The Eternals were created by the space gods called the Celestials who visited the Earth about 5 million years ago. They performed genetic experiments on early earthlings whilst giving them cosmic powers and hence making them near-immortals. Originally the Eternals were created as a force for good but later the race chose to remain in solitude. They are the primal enemies to the Deviants, who were also created by Celestials. Eternals and Deviants have been around for centuries and are often mistaken for local gods and other mythological figures. Eternals are impossibly beautiful while their rivals, Deviants are quite grotesque in nature. The latter rather act like a cult and think the world was only made for them. Eternals mythology has also been mentioned in the Guardians of the Galaxy films. As for Jolie, there is no word on who Jolie will play in the movie, yet. In the meantime, the 43-year-old actress will appear in Maleficent: Mistress of Evil, one of four live-action feature adaptations coming from Disney this year, along with Dumbo, Aladdin and The Lion King. Jolie will also star in the live-action/animation hybrid The One and Only Ivan. Director, Zhao who is internationally renowned for her films like The Rider (2017) and Songs My Brother Taught Me (2015) is currently being involved with the post-production of Nomadland, which stars 2018 Best Actress winner (Academy) Frances McDormand. 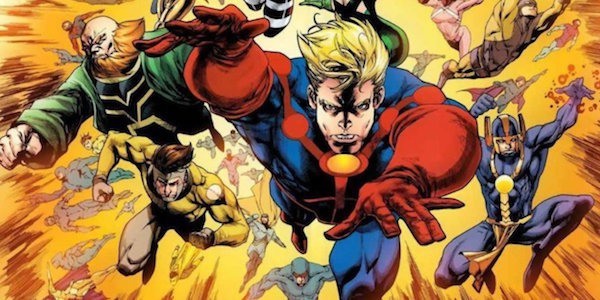 The Eternals movie is also expected to feature Marvel’s first openly gay character. After the Avengers: Endgame, Marvel will have a total of 9 untitled movies all set to release within the time frame of 2019 to 2022. However, the specific dates for each slate are yet to be revealed.